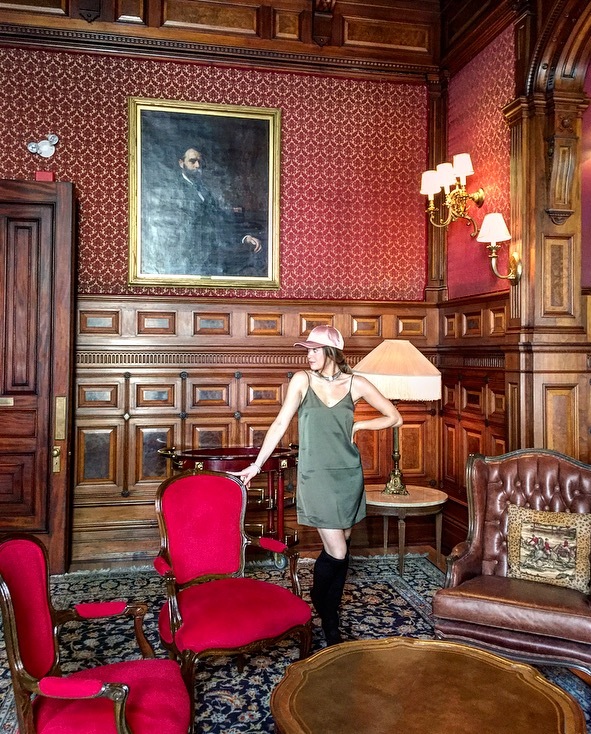 Let’s all give a warm welcome to the Golden Square Mile’s newest (and maybe one of the oldest) members in the area: The Mount Stephen Club and it’s long awaited luxurious Bar George. The old gentlemen's club turned hotel has been a long anticipated project 5 years in the making. The hotel’s redesign, the selection of staff, their training, and the vivid, uplifting menu are nothing short of a solid reflexion of all of the intricate work that went into its launch. Let’s discuss a few of the design details seen in the hotel and bar. 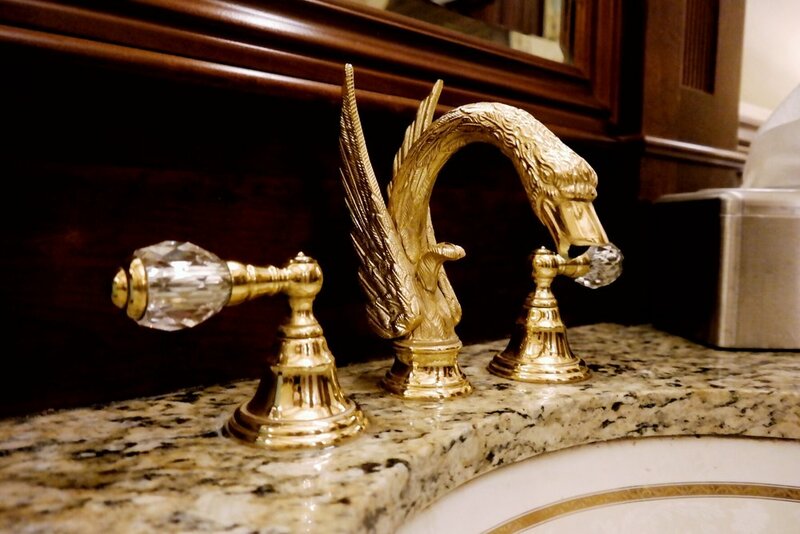 The gold swan spouts are nothing short of spectacular in the women’s bathroom, and beyond fitting with the luxurious setting of the Mount Stephen Club. I have to admit, though, that my first reaction was how perfect they would sit in a modern, white marble tub! You can also find the zebra wallpaper in the dinning hall of the Mount Stephen Club in Kate Spade’s home... the paper designed by Chef Gino Circiello, an Italian restaurantowner in New York City. The story goes that the wallpaper was inspired by his dream of going on an African safari, which he felt he would never be able to do. The wallpaper has also been featured in ELLE Decor.Say no more - you sold me at Kate’s home! And my last fave design charm; the pig coffee table near the bar. All this to say that the details of the club did not go unnoticed… for one second. Metaphore Design redesigned and restored the old heritage style and mixed it with modern twists of luxury - perfectly! Friendly, knowledgable, multilingual and talented beyond your expectations! Let’s start with the fact that the restaurant scooped up one of Montreal’s food and bev sweetheart’s Marco Gucciardi (previously of the Burgundy Lion Group) as their General Manager. Good move, gang! They didn’t stop there. The executive chef is Anthony Walsh from the Oliver and Bonacini group, and the Chef de Cuisine is none other than Kevin Ramasawmy previously of Maison Boulud. The phenomenal food speaks for itself and definitely upholds their reputation. I’m totally a health nut, but also a big believer in eating whole foods as the healthiest option. My favourite dish on their brunch menu was the muesli with French cheese, try it! The staff will help you pick everything to your liking, take your coat, find the perfect seat, drink, meal and answer any of the questions you might have, and have expert knowledge on the menu. It is far from your traditional Montreal restaurant. Bartenders play up their mixologist skills, making drinks for every style & need, with far more options than standard menus. I asked for something with wine (since it’s the only type of alcohol I like), nothing sweet, something fresh, and said, “Surprise me”. Be sure to ask for Floriane behind the bar. He did nothing short of preparing me a special twist from their menu’s Lady’s Stephen cocktail which perfectly matched my brunching mood. The setting may be historical but you're welcome to kick it at the bar in any style. It’s a ‘come one, come all’ and ‘enjoy the club’ kind of vibe. From suits to sneaks, you’ll fit in. That’s the beauty of Montreal, after all! We trust our city slickers. They dress well and respect Montreal’s multifaceted culture… Bar George welcomes them! The bar and restaurant service will be open 7 days a week. Dining rooms are available for private reservations, as well as their spectacular terrace that can hold up to 200 people. If you are just curious, which you should be, stop by and take a peak. You wont regret it!